The frequency of oscillation is given asÂ Capacitors C1 and C2 are kept fixed while caÂ­pacitor C3 is employed for tuning purpose. However, precaution is to be taken in selection of C3. If capacitor C3 is made too small, theÂ L-C branch will not have a net inductive reactance and under such condition the circuit will refuse to oscillate. In a Colpitt’s oscillator, the resonant frequency is affected by the transistor and stray capacitances because the capacitors Cr and C2 are shunted by the transistor and stray capacitances and so their values are altered. But in a Clapp oscillator, the transistor and stray capacitances have no effect on capacitor C3, so the oscillation frequency is more stable and accurate. 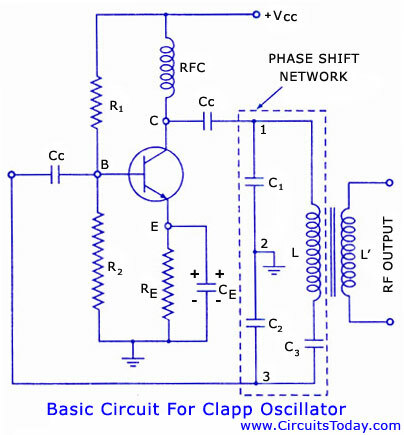 This is the reason that Clapp oscillator is preferred over a Colpitt’s oscillator. High frequency stability can further be obtained by enclosing the entire circuit in a constant temperature chamber and by maintaining the supply voltage constant with the help of a Zener diode.